A £200m out-of-town shopping centre in Dorset may remain closed over Christmas - with stores losing out on trade - because of car park safety fears. The 3,000-space car park at the Castlepoint Centre in Bournemouth was closed on Thursday morning for a third time since it opened two years ago. Managers said they were working to resolve the situation but were unable to confirm how long it would be closed. 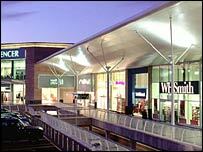 The centre is one of the largest UK shopping centres recently built. Peter Matthews, Castlepoint manager, said he was "not aware" that it was the same problem that caused the closure in May. "It will be closed until the issues are put right," he said. "We don't know what the issues are so we don't know how long it will take to put those right. "What happened in May was an isolated incident. I'm not aware that it's the same incident that happened in May but it could be related to the same problems." He said that in terms of compensation the Castlepoint Partnership will "honour what ever contractual arrangements it has". "We have contractual obligations to the traders at Castlepoint and we will maintain a dialogue with them in terms of impact of this on their businesses," he said. Retail union Usdaw welcomed the closure and said it had been warning the Castlepoint management about the problems with the car park for more than a year. Usdaw area organiser Colin Davies said: "We have been telling the management for over a year that there were serious problems with the car park. "This is a very serious health and safety issue for our members and shoppers so we welcome this closure while an investigation takes place." The union represents workers at Sainsbury's, Argos and Marks and Spencer. Castlepoint spokesman Mark Harris told the BBC News website it was not clear how many staff would be affected but most stores were telling them not to turn up for work. However, Adrian Fagg, store manager at Sainsbury's, said their staff had turned up for work and were being directed to other Sainsbury's stores in the area. He said: "In terms of supplies we are able to transfer out all our short-life perishables to our neighbouring stores." The 41-acre (0.17-km square) centre is a joint venture between Standard Life Investments, Castlemore Securities Limited and Threadneedle Investment Properties Limited, acting on behalf of Eagle Star Life Assurance Company Limited. It cost more that £200m to build and at the time of construction it was the largest shopping centre being built in the UK, opening in 2003.